It's a fiesta at St. Bruno's! 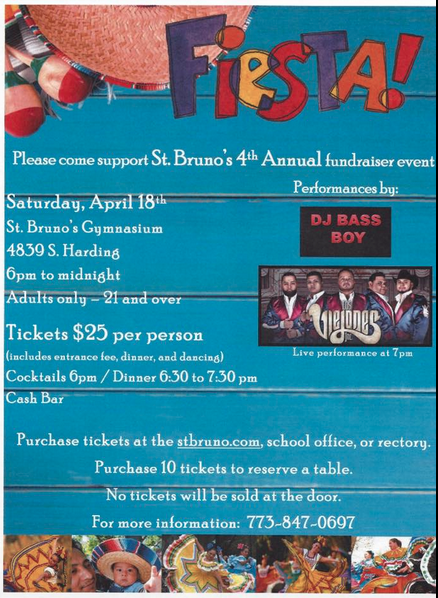 Mark your calendar for Saturday, April 18 and get ready to have fun and support a great school at the same time! The fun starts at 6 p.m. and runs 'til midnight in the school's gym, 4839 South Harding. Adults only (21 and up). Tickets are $25 person and includes dinner at 6:30 p.m.. Cash bar. Great music! Check out the event flyer for details. Tickets are pre-sale only. No tickets sold at the door. Buy your tickets now at the school office or rectory. Or call (773) 847-0697 for more information. Better yet, round up your family, friends and neighbors and buy a table of ten!